What is Carrier Grade NAT (CGNAT)? Carrier grade NAT is NAT444 and NAT444 decodes Private to Private IP addresses, then to Public IP addresses. ISPs consuming Carrier grade NAT were able to replace Public IP addresses with Private IP addresses on customer’s Edge routers. This permits numerous client networks to allocate a usual Public IP address. Before I start with the BIG-IP CGNAT, Let me explain you the CGNAT is simple words. Let us suppose we have three customer CPE1, CPE2 and CPE3 from 3 different customer, The local IP address for all these three customers are same and let us suppose that is 192.168.1.0. Now here with the help of CGNAT we first translate customer private network IP to another Private IP and let us suppose we translate it to 172.16.1.0 for CPE1, 172.16.2.0 for CPE2 and 172.16.3.0 for CPE3 and then converted to Public IP address and that is 5.10.10.10 for all the customer. It means we are translating the Customer Private IP to Private IP and then to Public IP address. It's called CGNAT. Here in this article we are going to talk about the BIG-IP CGNAT and the capabilities of CGNAT provided by BIG-IP. BIG-IP Carrier-Grade NAT (CGNAT) supports both IPv6 and IPv4 addresses, without expensive hardware advancements. IPv4 packets are encapsulated in an IPv6 tunnel and sent to an external IPv4 destination. BIG-IP Carrier-Grade NAT proposes service providers tunneling solutions with Dual-Stack Lite abilities as well as native network address translation solutions, such as NAT44 and NAT64. It offers carrier-grade scalability by contribution a very high number of IP address translations, very fast NAT translation setup rates, high throughput, and high-speed logging. BIG-IP Carrier-Grade NAT has the capability to increase to millions of IP address translations, interpretation setup rates in the order of a million per second, and tens of gigabits of performance. Its additional advances functioning with high-speed logging (HSL) abilities. This allows to decrease expenditure as can grip your relocation needs with less servers in the network. 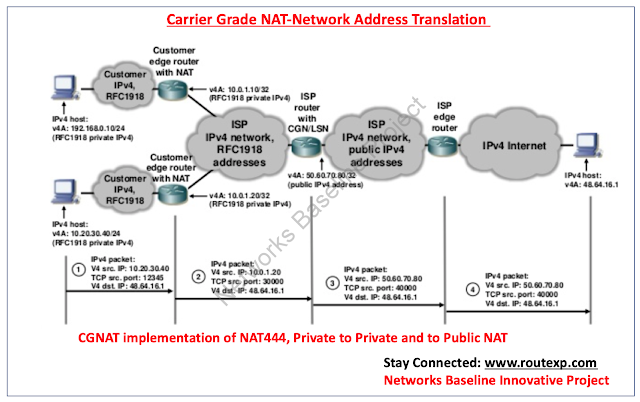 BIG-IP Carrier-Grade NAT also offers NAT64. The NAT64 feature permits service providers with IPv6 endpoints to effortlessly and clearly access IPv4 content and targets by interpreting among IPv6 and IPv4 addresses.BIG-IP Carrier-Grade NAT also have support to PLAT, which is the provider-side stateful translator that translates N:1 global IPv6 addresses to IPv4 addresses. BIG-IP GTM DNS64 permits IPv6 hosts to get IPv4 destinations as IPv6 addresses. For DNS servers that accept needs for a domain’s AAAA records (IPv6) but only find A records (IPv4), DNS64 creates the AAAA records from the A records and forwards them to the user, allowing networks with IPv6-only endpoints to endure accessing IPv4 and IPv6 content.